Idle Muse Theatre presents the Chicago premiere of THE WOMAN WHO AMUSES HERSELF. Mona Lisa is famous. The 16th century portrait is recognized even by people with little to no art background. 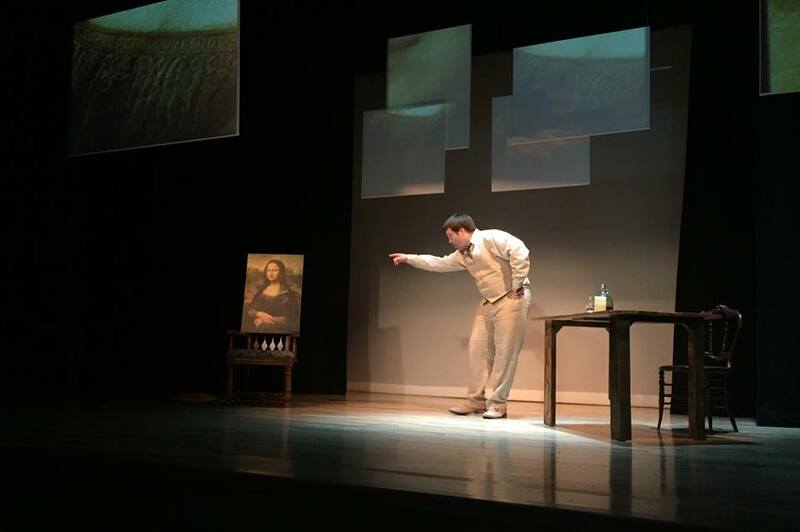 Playwright Victor Lodato uses the iconic painting as the subject of his play. In 1911, Vincenzo Peruggia (played by the outstanding Nathan Thompson) stole the portrait from the Louvre. Peruggia held Mona Lisa hostage for 2 and half years. Or perhaps Mona Lisa held Peruggia hostage. Lodato imagines the bewitched housepainter’s motivation and obsession that drove him to steal, to drink and to eventually confess. Under the skillful direction of Nathan Pease, the show amuses as an art appreciation tutorial meets history lesson. Pease cleverly introduces us to several distinct perspectives on the painting. The main story is about Peruggia. And Nathan Thompson plays it perfectly tormented. He is living with his silent, ever-smiling love. Nathan Thompson’s frazzled state is terrific. 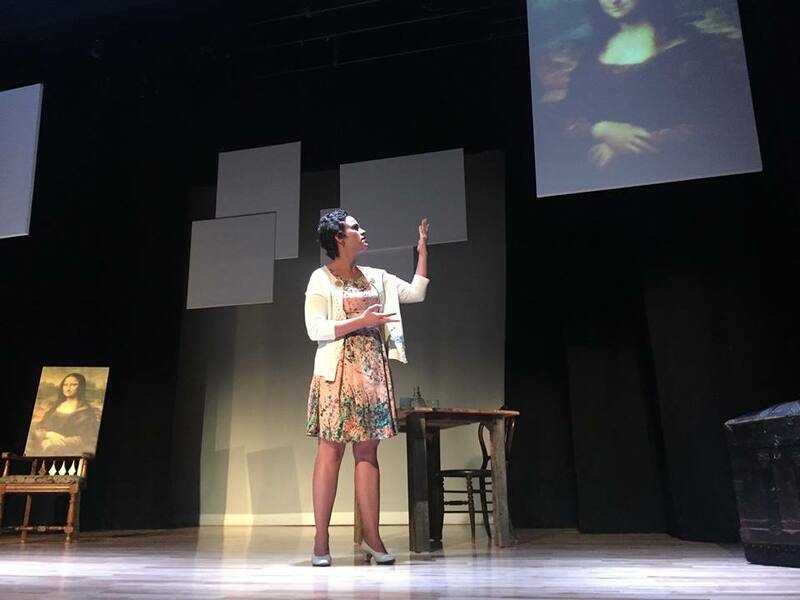 At several points, he screams ‘stop staring at me.’ Projection Designer Laura Wiley emphasizes those moments with several screens zeroing in on Mona Lisa’s eyes. Throughout the show, Wiley’s beautiful visuals illustrate the artistry of life. After spilling his wine, Nathan Thompson is losing it as he fanatically scrubs the floor. Wiley contrasts his mania with an elegant aesthetic. A wine glass tips over and spills across the screens. Lodato not only helped me connect to Peruggia as a celebrity stalker, he used Peruggia to build my understanding of the Italians at the time period. Their adoration for their homeland and the portrait showcased a passionate simplicity. In one of his monologues, Nathan Thompson describes the ill-prepared Italian army going into WWI with the same passionate simplicity. He talks about drinking and dying on the frontlines with the same resignation. 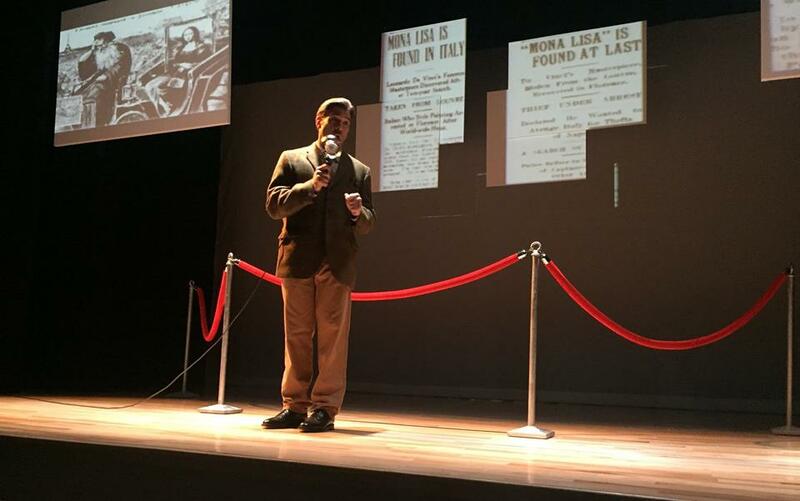 Later, he recounts the end of WWII. He says how the German soldiers fleeing Paris stopped at the Louvre. They banged on the doors and begged to see Mona Lisa before they evacuated. It’s a powerful notion that this portrait connects people across centuries and wars. Along with the Peruggia story, Pease uses his talented ensemble to look at art appreciation from different angles. The earnest Cat Hermes portrays a contemporary third grade teacher in the U.S.. She playfully interacts with the audience as if we are her students. Her dreamy expression as she wistfully describes a painting that she has never seen in person is heart-warming. Later one of her students, Almanya Narula, nervously describes her own personal experience with her Mona Lisa beach towel. It’s adorable. Mara Kovacevic (Peruggia’s mom) represents all the art naysayers. She hilariously describes her son’s Mona Lisa fixation with a my-son-has-lost-it nonchalance. The droll Joel Thompson portrays multiple characters with his signature affected diction. Joel Thompson delivers comedic gold timing with a well-placed pause or lingering on a syllable. There’s a lot to enjoy about this wonderful art lesson. THE WOMAN WHO AMUSES HERSELF is only amusing Chicago for four more shows. I highly recommend seeing the play about the painting that has held the world spellbound for centuries.